Today is the right time to make list of tasks to the May. During April I did 19 art objects for CyberWas project, mostly in big size. Actually it`s 17 for Section 1 and 2 for Section 2, so I prefer to reccognize it as a good result. Also I did i painting to Dr. Ichak Adizes en.wikipedia.org/wiki/Adizes , having my plan to make about 20 painting deducates to his great system of management. I will start it for tomorrow because my imagination don`t allow me to sleep well until I do it at least 2-4 painting. So when Dr.Adizes will be here in Moscow it could be interesting to him to see the System visualized. 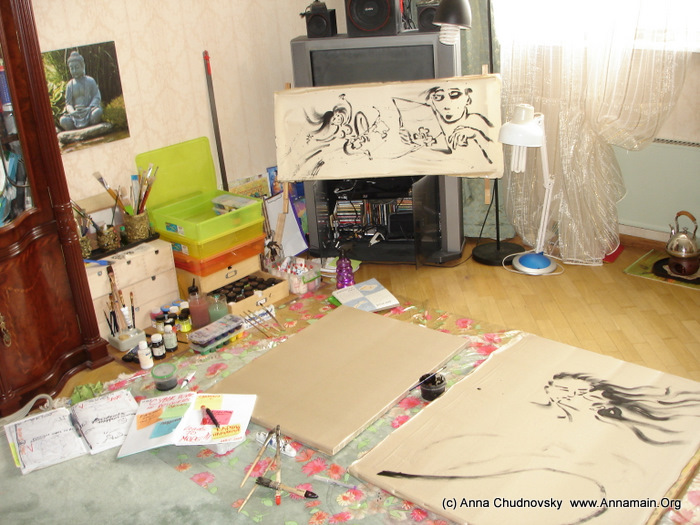 Also I did 1 painting deducates to my late grandma, Riva Chudnovsky, I`ll show it next post. I will continue that historical paintings later so it was the moment to point on it, observing her last gift to me - a candle to Shabbat. So it was the painting about Shabbat. So it is 21 painting during April. Really good result shows how productive I can be being concentrating to several concepts simultaneously and having no gaps in the process. It`s a kind of feelings as you prepare to drive a spaceship, being unlimited in speed and space. So grate pleasant feeling to feel my wings flattering to winds, heopes winds of changes. I prepare everything well so now should have a rest, reading old good science-fiction, after new good 3D IronMan-3 film.